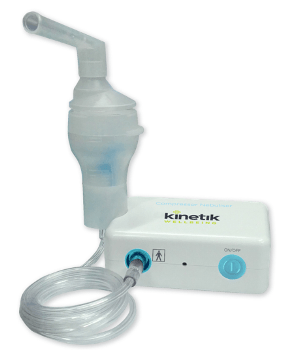 Kinetik’s Compressor Nebuliser is designed with speed and efficiency in mind, meaning you can spend the minimum amount of time taking your medication. With a short inhalation time and the ability to reach the upper, mid and lower airways you can be sure you’re getting the treatment you need. Our Compressor Nebuliser is In Association with St John Ambulance, providing you with a safe and effective way of delivering respiratory therapy. With only USB connection needed to function, you can use the Compressor Nebuliser where it’s convenient for you. Every Compressor Nebuliser comes with an adult and child mask, making it suitable for all the family. This, alongside its portability and high nebulisation rate, beats what you’ll find elsewhere on the market and at a competitive price. Unpack and assemble nebuliser, ensuring to insert batteries or connect device to USB port. Fill medicine cup with prescribed medication, and attach tube to medicine cup. Either place the mouthpiece between the teeth and close lips around it or place the mask tightly over the mouth and nose. Start treatment and inhale medication slowly and deeply until nebuliser cup is empty.